Aims: To compare three-dimensional conformal radiation therapy (3DCRT) and intensity-modulated radiation therapy (IMRT) in posterior fossa (PF) boost in children with medulloblastoma (MB); dosimetrically evaluating and comparing both techniques with regard to target coverage and doses to organs at risk. Subjects and Methods: Seven previously irradiated patients of MB were retrieved and re-planned with both 3DCRT and IMRT techniques. Dosimetric comparison was done by performing two plans for the PF boost for the same patient. Prescription dose and normal tissue constraints were identical for both plans. Statistical Analysis Used: SPSS, version 19, statistical software package was used. For quantitative data, paired t-test was applied to calculate the difference between two means. Results: Mean values of planning target volume (PTV); PTV95% and PTV5% in IMRT were 97.19% and 106.07% and for 3DCRT were 96.57% and 106.33%, respectively. The dose homogeneity was better in IMRT (1.091) as compared to 3DCRT (1.100), but was not statistically significant (P = 0.341). Conformity index was comparable in both the plans, i.e., 3DCRT (0.979) and IMRT (0.976) with P = 0.819. IMRT plan provided reduced mean dose to cochlea relative to the 3DCRT plans with P = 0.032 for the right cochlea and 0.020 for the left cochlea. IMRT showed no advantage over 3DCRT in sparing the anterior cranial structures where mean doses to the right and left lens were 0.61 Gy and 0.56 Gy for IMRT and 0.16 Gy and 0.09 Gy for 3DCRT, respectively. Conclusions: IMRT technique was able to improve homogeneity index, spare the cochleae, but 3DCRT plans were superior in sparing anterior cranial structures without compromising the dose to PF. Primary central nervous system (CNS) tumors are the most common solid tumors in children. The posterior fossa (PF) is the site of about half of these tumors, including medulloblastomas (MBs), cerebellar and brainstem astrocytomas, and fourth ventricular ependymomas. MB is the most common malignant neoplasm of the CNS in children, constituting approximately 20% of all pediatric brain tumors. The current standard of care consists of maximal safe resection followed by radiotherapy (RT) and chemotherapy, yielding a 5-year survival rate of 80% for average-risk MB and 50% for high-risk disease. RT of the PF tumors is technically challenging, and radiation-induced side effects have been a primary concern in those patients. The concern has been the greatest for patients with average-risk MB, for whom long-term disease control is expected, and the side effects of the therapy have more significant lasting impact. The overall 5-year survival rate is 60% for patients of MB treated with surgery, craniospinal irradiation (CSI), and chemotherapy. Debilitating side effects occur in almost all patients who survive RT despite the use of protons as opposed to photons. Late side effects include cognitive impairment, psychiatric disorders, endocrine dysfunction, and skeletal growth retardation. The standard treatment for average-risk MB includes postoperative CSI with a dose of 23.4 Gy, irradiation of the anatomic PF to 55.8 Gy, and 12 months of combination chemotherapy according to the Children's Oncology Group. Reducing the dose to neuraxis in the absence of chemotherapy has produced limited success. Three-dimensional conformal radiation therapy (3DCRT) allows manual optimization of beam orientation, beam weighting, and beam eye view shaping. However, the problem of dose inhomogeneity and suboptimal conformity to the concave target volume is still unresolved. 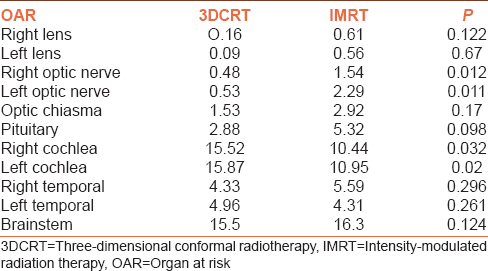 Intensity-modulated radiation therapy (IMRT), compared with 3DCRT, provides more freedom with allowing dose intensity modulation within each individual beam. As a result, the dose distribution can conform to the target to an extent that was not reached previously. In addition, the dose constraints assigned to critical structures in the optimization process allow better preservation of organs' function than achieved by the conventional two-dimensional RT (2DRT) or 3DCRT. The purpose of our study was to compare 3DCRT and IMRT in the PF boost in children with MB; evaluating and comparing both techniques with regard to target coverage and doses to organs at risk (OARs). The study design was accepted from our Institutional Scientific Committees. A written consent was taken from all patients before starting RT. Seven previously irradiated patients of MB were retrieved and re-planned with both 3DCRT and IMRT techniques. A dosimetric comparison was done by performing two plans for the PF boost, 3DCRT, and IMRT plans, for the same patient. Prescription dose and normal tissue constraints were identical for the 3DCRT and IMRT plans. All patients were immobilized in the prone position using customized thermoplastic masks on an adjustable prone head rest for head support. Planning computed tomography (CT) images were acquired from the vertex to the coccyx on a Somatom Emotion Duo CT simulator (Siemens Medical System), with 3 mm contiguous slice thickness and then transferred through DICOM networking to Oncentra MasterPlan (OMP) Treatment Planning System (TPS) (Nucletron India Pvt. Ltd., Mylapore, Chennai, Tamil Nadu, India), where the target volumes and OARs were delineated. Target volume delineation was performed in accordance with internationally accepted guidelines. The treatment was divided into two phases. Phase one included CSI aiming at 36 Gy in 20 fractions over 4 weeks. Phase two targeted the PF (18 Gy/10 fractions) on 6 MV Linac. Comparison was done between the two phase plans of the two techniques (3DCRT and IMRT). The clinical target volume PF (CTVPF) boost volume encompassed the entire PF. The PF was defined on a planning CT scan. The CTVPF extended from the foramen magnum inferiorly to the bony walls of the occiput and temporal fossa posteriorly and laterally and superiorly to the tentorium cerebelli. The anterior borders of the brainstem and midbrain bind the PF contents anteriorly. The planning target volume (PTV) PF (PTVPF) consisted of a 0.5 cm geometric margin around the CTVPF. PTVPF was limited to the bony confines of the skull, except at the foramen magnum where it extended to the level of C1. The PTVPF extended anteriorly to the posterior clinoids, excluding the pituitary gland and inferiorly to the C1-C2 junction. The PF boost was given using two lateral opposing fields, and shaping was done using the multileaf collimators (MLCs). IMRT was planned using a seven field inverse treatment planning technique. The beams were spread around the target with equidistant gantry angles. Gantry angles of 0°, 50°, 100°, 150°, 210°, 260°, and 310° were used with step and shoot IMRT treatment delivery technique with an 82-leaf MLC on 6MV energy LINAC. The treatment isocenter was set at the geometrical center of the PTV. The number of fields and the beam geometry were fixed in all patients to avoid variability in the results due to different beam arrangements. Plan optimization was done with IMRT software (Nucletron) in OMP TPS. Dmax was used for optic chiasm 9 Gy, optic nerves 9 Gy, brainstem 18 Gy, and lenses 0 Gy. For the temporal lobes, the dose constraint was 10 Gy. For the cochlea, the dose constraint was 7 Gy. The minimum and maximum doses to the PTV were directly analyzed from the dose volume histogram (DVH). It was calculated as dose homogeneity within the target volume, comparison between the volume of PTV receiving 95% of the prescribed dose (V95%) and volume of PTV receiving ≥107% of the prescribed dose (V107%) for each technique and minimum dose in the target volume (Dmin). Homogeneity index (HI) is defined as the ratio of D5% to D95% for the PTV. Where D5% and D95% corresponds to the dose received by 5% and 95% volume of the PTV, respectively, and smaller HI implies a better plan. Conformity index (CI) was calculated using RTOG equation. CI = Volume covered by the reference isodose (95%)/total target volume. Dose received by the OAR was compared for each contoured structure in terms of mean dose and maximum point dose. Data were statistically described in terms of mean ± standard deviation, median, and range. Statistical analysis was done using SPSS, version 19 (IBM), statistical software package. For quantitative data, paired t-test was applied to calculate the difference between two means. P < 0.05 was considered to be statistically significant. The image of the axial slice showing dose distributions resulting from 3DCRT and IMRT for one of the representative cases is shown in [Figure 1]. By reviewing the DVH parameters (DVPs) of the two treatment plans for all patients, the following are the results as regards the dose distribution of the PTV and OARs including non-PF brain, pituitary, cochlea, eyes, lenses, optic nerves, and optic chiasma [Table 1] and [Table 2]: [Table 1] gives the statistical analysis and DVPs for PTV, and [Table 2] lists the mean doses delivered to OARs by IMRT and 3DCRT plans. PTV coverage (D95%) was adequate and comparable for both plans. There was no statistical difference between 3D RT and IMRT in terms of V95% keeping a minimum of 95% dose coverage for PTV and a maximum dose below 107% as recommended by the ICRU planning guidelines. Average V95% in 3D planning was 96.57% whereas in IMRT planning, it was 97.19% (P = 0.422). Mean value of V107% was 2.88% in 3DCRT and 2.42% in IMRT plan (P = 0.525). The dose homogeneity was better in the IMRT (1.091) as compared to 3DCRT (1.100), but was not statistically significant (P = 0.341). CI was comparable in both the plans, i.e., 3DCRT (0.979) and IMRT (0.976) with P= 0.819 [Table 1]. IMRT plan provided reduced mean dose to cochlea (right 10.4 Gy and left 10.9 Gy) relative to the 3DCRT plans (right 15.5 Gy and left 15.8 Gy) with P= 0.032 for the right cochlea and 0.020 for the left cochlea. Both cochleae received the target dose in 3DCRT beam arrangement because they are entirely within the parallel opposed fields, and as a result, the minimum and maximum doses are very near the prescribed dose. For each patient, IMRT plan delivered lower doses to the inner ear, without significantly compromising the dose distribution to the PTV. Doses to the temporal lobes were also less in the IMRT technique (right 5.59 Gy and left 4.31 Gy) than those with the 3DCRT plans (right 4.33 Gy and left 4.96 Gy), yet it did not reach the significant level. 3DCRT delivered the lowest doses to the anterior cranial structures. Although the doses to the optic nerves were acceptably low in IMRT plans, 3DCRT plans reduced doses to optic nerves better than the IMRT plans because all the beams in IMRT were directed anteriorly. Similarly, IMRT plans showed slightly increased lens doses relative to 3DCRT parallel opposed beams with MLC shaping. However, in all cases, the lens dose was below the threshold for cataract induction. Pituitary doses were acceptable for both plans, but IMRT tended to deliver the higher doses due to the orientation of all four treatment fields toward the gland [Table 2]. IMRT plans were comparable to 3DCRT in terms of V90% to most OARs, but the lowest dose volume (V10%) chosen in this study was highest with IMRT for most of the OARs in the anterior cranial fossa. Both high- and low-dose volume V90% and V10%, respectively, were considerably reduced for both cochleae with IMRT techniques. 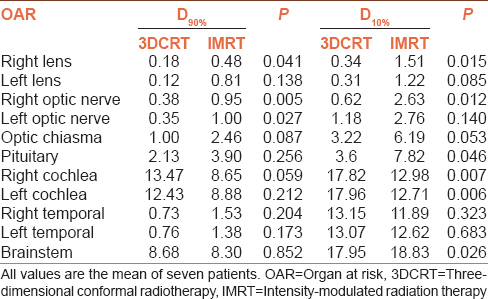 The percentage volumes of each OAR receiving high (V90%) and low doses (V10%) of radiation from the two different treatment planning techniques are presented in [Table 3]. The mean monitor units to deliver a 2 Gy/fraction were 218.44 in 3DCRT and 434.71 in IMRT. In children with MB, which is a common childhood malignancy, various critical structures such as the developing brain, bone, thyroid gland, pituitary gland, and cochlea may not be fully developed. Furthermore, as the majority of patients will survive, long-term survival in this disease is about 55–65%. Recent reports highlighted the importance of minimizing the dose to these OARs below their tolerance values during craniospinal and/or PF boost irradiation, otherwise, late effects of radiation therapy such as somatic and carcinogenic effects may be observed during the follow-up period., The standard treatment for MBs includes surgical resection, followed by RT to the craniospinal axis and then “boost” RT to the PF with or without chemotherapy. The PF presents a suitable target for conformal RT, as it is easily immobilized and like adjacent OARs, it is readily identified on CT planning scans. In this study comparison, between 3DCRT and IMRT techniques for the treatment of MBs, patients showed no significant difference in dose coverage and distribution, while IMRT planning provided better cochlear sparing. This was shown previously by Breen et al. in a comparative study between 2D treatment (parallel-opposed lateral pair); 3DCRT (two wedged posterior oblique fields); and a four-field coplanar IMRT plan for PF treatment. They found that all techniques were able to provide acceptable coverage of the target volume. However, 3DCRT and IMRT reduced the dominant OAR (the cochlea) doses to <70% of the mean target dose. Paulino et al. also demonstrated normal tissue sparing with conformal techniques. Our IMRT plans were optimized to reduce cochlear dose while maintaining PTV dose homogeneity. The inclusion of optimization of other OARs may produce reduced doses in anterior cranial structures, but perhaps at the expense of PTV uniformity. Huang et al. compared ototoxicity with the use of conventional (2D) RT (n = 11) versus IMRT (n = 15) in 26 pediatric patients with MB. Thirteen percent of the IMRT group had Grade 3 or 4 hearing loss, compared to 64% of the conventional RT group (P < 0.014). IMRT showed no advantage over 3DCRT in sparing the anterior cranial structures in this study. Hence, the results of the current work agree with Breen et al. where coplanar 3DCRT was judged superior to coplanar IMRT, particularly in children, because it achieved adequate sparing of the cochlea and anterior cranial structures, such as the lenses and optic nerves, without compromising the dose to the PF. Two major concerns often raised over the use of IMRT, especially in children, are the increase in whole-body dose and the larger volumes of normal tissues irradiated at relatively lower radiation doses when compared with conventional RT. These two factors can potentially increase the risk of radiation-induced carcinogenesis, particularly in children and long-term survivors.,,,, In fact, the relatively large number of monitor units associated IMRT could result theoretically in a higher risk of secondary carcinogenesis. The mean monitor units delivered in our study were 218.44 in 3DCRT and 434.71 in IMRT technique. Currently, there is no clinical evidence of secondary malignancies in MB treated by IMRT which have been reported. The benefit of IMRT, especially sparing of OAR is considered to be more significant for treatment outcomes than increased risk of secondary malignancies in current practice. However, it should be used with caution, especially in patients with long-term survival. The study served to show that IMRT treatments achieve better target conformity, slightly better PTV homogeneity, and was noted to have reductions in maximum dose of selected OAR such as cochlea and temporal lobes when compared to 3DCRT plans. The mean dose values to the 3DCRT plans were superior in sparing anterior cranial structures, but none of these patients received cataract induction dose with IMRT technique. Beam-on times were significantly greater for the IMRT plans as compared to the 3DCRT treatments having the shortest beam-on time. The gain in target conformality with IMRT should be balanced with the spread of low doses to distant areas. This remains an open issue for the potential risk of secondary malignancies, and longer follow-up is mandatory. Breen SL, Kehagioglou P, Usher C, Plowman PN. A comparison of conventional, conformal and intensity-modulated coplanar radiotherapy plans for posterior fossa treatment. Br J Radiol 2004;77:768-74. Central Brain Tumor Registry of the United States (CBTRUS). Statistical Report 2005-2006. Primary Brain Tumors in the United States: 1998-2002. Hinsdale, IL: CBTRUS; 2006. Packer RJ, Gajjar A, Vezina G, Rorke-Adams L, Burger PC, Robertson PL, et al. Phase III study of craniospinal radiation therapy followed by adjuvant chemotherapy for newly diagnosed average-risk medulloblastoma. J Clin Oncol 2006;24:4202-8. Moeller BJ, Chintagumpala M, Philip JJ, Grosshans DR, McAleer MF, Woo SY, et al. Low early ototoxicity rates for pediatric medulloblastoma patients treated with proton radiotherapy. Radiat Oncol 2011;6:58. Ibrahim NY, Abdel Aal HH, Abdel Kader MS, Makaar WS, Shaaban AH. Reducing late effects of radiotherapy in average risk medulloblastoma. Chin Clin Oncol 2014;3:4. Thomas PR, Deutsch M, Kepner JL, Boyett JM, Krischer J, Aronin P, et al. Low-stage medulloblastoma: Final analysis of trial comparing standard-dose with reduced-dose neuraxis irradiation. J Clin Oncol 2000;18:3004-11. El Din S, Abd El Aal H, Makaar W. A dosimetric comparison between 3D-conformal radiation therapy and intensity modulated radiation therapy plans in the treatment of posterior fossa boost in children with high risk medulloblastoma. Chin Ger J Clin Oncol 2013;12:540-5. Michalski J. ACNS0331 Medulloblastoma. Target Volume and Organ-at-risk Atlas. Available from: http://www.qarc.org/cog/protocol%20resources/ACNS0331Atlas. [Last accessed on 2015 Nov 30]. Helal A, Mostafa MF, Elsaka R. 3DCRT for posterior fossa; sparing of surrounding organs at risk. Alexendria J Med 2014;50:311-6. 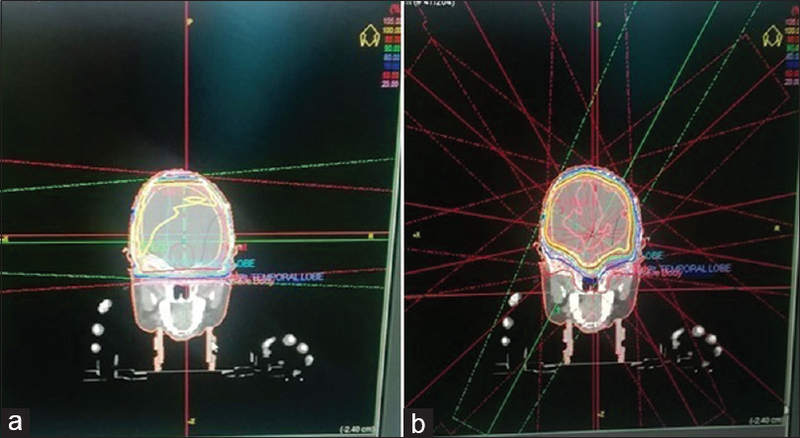 Paulino AC, Narayana A, Mohideen MN, Jeswani S. Posterior fossa boost in medulloblastoma: An analysis of dose to surrounding structures using 3-dimensional (conformal) radiotherapy. Int J Radiat Oncol Biol Phys 2000;46:281-6. Huang E, Teh BS, Strother DR, Davis QG, Chiu JK, Lu HH, et al. Intensity-modulated radiation therapy for pediatric medulloblastoma: Early report on the reduction of ototoxicity. Int J Radiat Oncol Biol Phys 2002;52:599-605. Followill D, Geis P, Boyer A. Estimates of whole-body dose equivalent produced by beam intensity modulated conformal therapy. Int J Radiat Oncol Biol Phys 1997;38:667-72. Mutic S, Low DA. Whole-body dose from tomotherapy delivery. Int J Radiat Oncol Biol Phys 1998;42:229-32. Rembielak A, Woo TC. Intensity-modulated radiation therapy for the treatment of pediatric cancer patients. Nat Clin Pract Oncol 2005;2:211-7. Suntornpong N. Intensity modulated radiation therapy in pediatric cancer; clinical outcome and risk of radiation-induced malignancies. Siriraj Med J 2015;67:41-5.